Designed to eliminate need for sandwich patching, LF311 printable hole patch features protective, adhesive-free center that eliminates adhesive exposure and contamination through backside of paper web. This 3.5 x 7 in. product, constructed from 2.2 mil 3M Repulpable tape, has Â¾ in. adhesive perimeter and oval shape to reduce edge shock. After application, there is no transfer of impressions or glue to next layer of paper in roll. Light Fabrications, Inc. Announces New Product "Repulpable Hole Patch" with Adhesive Free Center for Repairing Holes in Web for Paper Mills. 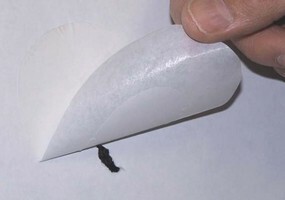 Rochester, New York, June 2, 2008 -- Light Fabrications Corp., a contract manufacturing and specialty converting company, today announced that it has developed a hole patch for paper web repair. Working closely with 3M and paper mill engineers, Light Fab was able to develop a patch which eliminates the tedious sandwich patching that has been a standard in the industry for so long. The protective adhesive free center of the LF311 eliminates adhesive exposure and contamination through the backside of the web. LF311 is oval shaped to reduce edge shock encountered with typical square patches. The patches are constructed from one of the thinnest 3M Repulpable tapes on the market (2.2 mil.). Impressions nor glue transfers to the next layer of paper in the roll. Based in Rochester, NY, Light Fabrications, Inc. is a contract manufacturer and specialty converter of pressure sensitive adhesive, tape, foam, and film products. Light Fabrications serves customers spanning almost all industries including industrial, medical, automotive and electronic. In operation since 1977, Light Fabrications has teamed with leading material manufacturers such as 3M, Rogers, GE and many others. They stock master logs of material to convert into custom size rolls, sheets, die cuts, and specialty laminations. Additional information on Light Fabrications' products and services can be found at www.lightfab.com.